The Eel River watershed drains 3,684 square miles of California’s rugged North Coast eco-region. 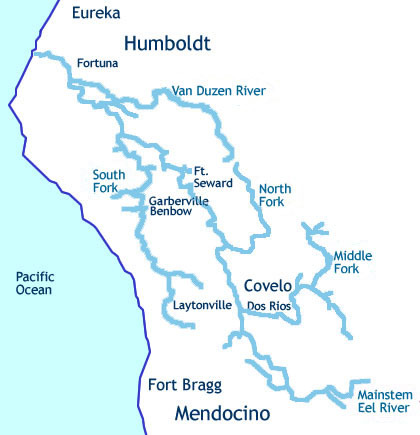 This magnificent river system includes not only the south, middle, north, and main stem forks of the Eel but also the Van Duzen River. The Eel River has both State (1972) and Federal (1981) Wild and Scenic River designations, which protect more than 350 miles of its waterways from additional damming and ensure that environmental concerns rank at least equally with development and industry. Learn more about the Federal Wild & Scenic designation here. Despite these protections, exploitation of Eel River water, as well as habitat destruction, continues. Two dams block fish passage entirely for about one-tenth of the watershed and divert a seasonally significant amount of water to the Russian River. Poor land use practices exacerbate the problem to the point of crisis. Without concerted action to remedy these threats, Eel River salmon and steelhead populations could go extinct. Learn about the natural and cultural history of the Eel River Valley. Click here to learn more about key species found in the Eel River, including their listing status and cultural significance. Click here to see fish count data from the Department of Fish & Wildlife fish counting station at Van Arsdale Reservoir. Learn about state parks, national forests, and where to raft, hike, or camp in the Eel River watershed.